Later this week I shall be following a path already trod by hundreds of thousands of people, but for each individual the path is something of a unique experience and also a blessed relief. I am referring to knee-replacement surgery but for others it will be their hips instead. As a young man through to middle age I have been fortunate to enjoy good health. I still do enjoy good health but over the past decade, my mobility has got slower and slower as arthritis began to effect both my knees. It is the sort of thing that one does not notice too much at first and it is the sort of thing one tends to consider ageing pains. However there comes a point when walking becomes not only a slow crawl, but painful as well. I already have a broken cruciate ligament in one knee which makes ascending or descending stairs or slopes difficult if not impossible on occasions..The sudden deterioration of my other knee also due to arthritis caused something of a dilemma, as I unconsciously tended to use it as a prop when walking to support what was at the time the weaker knee. It was then that I paid one of my rare visits to see my doctor. Normally I only see my doctor once a year for a anti-influenza jab.For me visiting my doctor with an actual medical complaint was a strange experience and I did not quite know what to expect. After an examination I was referred off for X-rays and I must say that proved a pleasant experience to what I expected and did not require making a appointment. It was possible to walk into a local hospital at a time of my choosing and get my X-rays done immediately.Until then my only experience of hospital appointments were historical third-hand stories of dozens of people all being told to turn up at the same time. One does occasionally hear stories of people waiting long periods of time, possibly more than a year for surgery but that has certainly not been my experience in Somerset where I live. The complete time scale has only been about eight weeks and the treatment centre I have chosen is a small one in Shepton Mallet that is also used by the NHS and known as the Shepton Mallet NHS Treatment Centre. Amongst a wide variety of conditions, the treatment centre specialises in hip and knee surgery and only has two person rooms instead of the large wards of some hospitals. As the hospital also has free Wi-Fi, I thought I would try an experiment by bringing a small tablet computer with me and try to relate my daily experiences while I am there for about 2-3 days. I rarely use my tablet computer so I will apologise in advance for my lack of skills in using a touch-screen keyboard. By the next time I write, hopefully I will have had my operation and will be recovering from the aesthetic. . The one thing I am really looking forward too in the not too distant future is being able to enjoy meaningful walks in the countryside again. Not a particularly inspiring selfie of my legs and feet but at the moment it is all I can do as the lower half of my body is numb and immobile from the effects of a spinal anaesthetic injection. I have however already be told by the surgeon that the operation went well. Tomorrow I will be started on a course of physiotherapy exercises that are designed to tone and strengthen the legs muscles following the operation as well as ensuring the skin around the knee retains its elasticity which is necessary to ensure the full range of movement from the new knee is achieved . This will include the all-important walking exercises. The goal is to achieve walking for five minutes twice a day for the first four days, followed by ten minutes walking twice a day for the next four days. After that periods of walking duration rapidly increase. Once again I found everything done at the Shepton Mallet NHS Treatment Centre extremely efficient from the moment I arrived, The experience of the lower-half of one’s body being completely numb but still being fully conscious and aware of everything happening around me was quite strange. 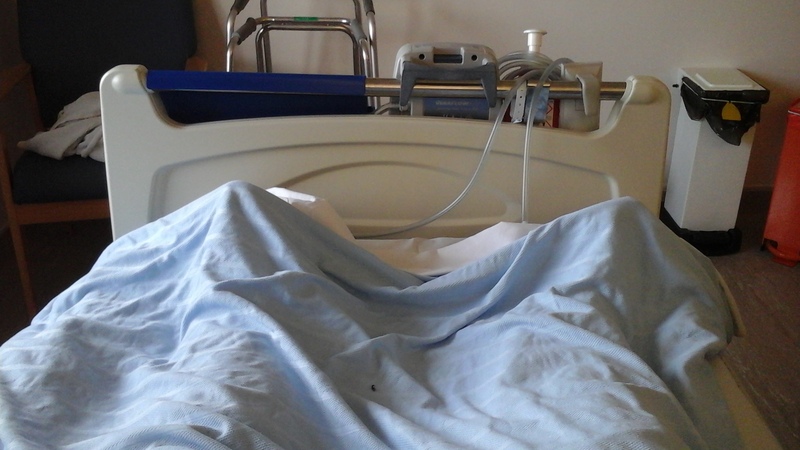 With so many tubes coming from various parts of my body along with accompanying wires that were to be connected to various pieces of equipment inside the operating theatre, I did rather feel like a turkey all trussed up waiting to be placed in the oven. Being conscious during the operation was also a strange experience. Although I could not see what was happening due to a screen placed between my head and the surgeon, I was fully aware what the surgeon was doing at any particular moment. While on the operating table my field of vision was more-or-less confined to the ceiling above. One thing I could see set in the ceiling directly above me was a large gauge or meter marked with graduations and a indicator needle. Unfortunately as I was not wearing spectacles at the time, I was unable to focus on the gauge to ascertain its purposes. I will have to ask on a return visit to Shepton Mallet as my curiosity has been aroused. Immediate post-op care has also been thorough and intense. As yet I have not experienced any pain but I was still placed in a recovery-room for one hour for all my vital body systems to be electronically monitored and then returned to my two-person hospital room, (although I am the only one here at the moment), where again I am being regularly monitored and tested as the effects of the anaesthetic gradually wear off. Since I started writing this update, the physioperapist has visited me to allow me to stand on both feet with the temporary aid of a Zimmer frame while doing some static marching steps. So far all is well with no pain and I look forward to tomorrows challenges. Last night being my first in hospital following my knee replacement operation and was not particularly comfortable. There were multiple tubes connected to my body including a oxygen feed to my nose, a catheter as well as feeds to anti-thrombosis compression pads on both legs which operated automatically about every 30 seconds. Severe aching in my operated knee caused most trouble as layers of thick padding and bandages had deliberately placed around it to prevent movement. The inability to bend my knee contributed to the ache but this is a deliberate trade-off to protect damage to the operation wound. Thankfully all the knee padding was removed first thing this morning to allow limited if still somewhat sore movement to my knee. I think it would be fair to add that many patients with newly operated knee replacements experience this initial discomfort on their first night, so there was nothing exceptional about what I experienced. It would also be fair to say that prior to my operation I was already experiencing a great deal of slightly lesser but similar discomfort from my worn out knee. An early visit from the physiotherapist took me through my first tentative steps on a Zimmer frame and I was also fitted for a pair of surgical crutches which will needed for support for about the next six weeks, until I repay a return progress assessment visit to the hospital. It is at that time I will hopefully be allowed to drive again. Another positive word from the physiotherapist is that as my walking and exercises were being completed in a text book fashion, I would probably be able to leave the hospital tomorrow. I was also issued with a few other medical aids. One was a medium sized softly-inflated ball which will be needed in knee exercises. A strap device known as a leg lifter with loops at either end which can be placed under the foot to assist raising it in initial stages until muscles strengthen, and a long shoe horn to assist putting on shoes. I was also started on a exercise regime. These are exercise that have to be done five times a day. The exercises although simple enough to complete with a healthy knee are surprising difficult on a newly operated knee. As muscles tone up and strengthen with the exercises, they are replaced by even more difficult ones. I was also taken in a wheelchair for X-rays on my knee to see the operation had been successful internally. I did see the X-rays and they looked fine to the untrained eye but it will require expert medical opinion to determine that. I found riding in a wheelchair a unique experience as I have never had the occasion to use one before in my life. Now it is a case of resuming my exercises at two hourly periods throughout the rest of the day, and hopefully followed by a more restful night tonight. In the morning hopefully I will receive the good news I can go home. I suspect when I return home with my ‘goodies’, the medical aids I have been issued with, I will feel like the child returning from the fairground proudly holding a balloon, except in my case it will be a ball. One thing is certain, I will have to hide that ball from my Labrador dog, as she instantly claims any ball she sees as her own property. Well I received good news this morning from the treatment centre consultant doing his rounds. As my progress has been more than satisfactory he has decided I can go home today. Earlier in the morning the physiotherapist had taken me to a room equipped with various walking obstacles that new knee replacement patients are likely to encounter. One example of this was a short flight of stairs which are easy enough for a able bodied person, but a major challenge to a new knee-replacement patients who temporarily have no pushing power in their knees or legs muscles. I found this stair challenge quite simple as the knee which I had replaced previously had a broken cruciate ligament which posed similar problems on stairs and slopes. There is a small easily remembered small saying which physiotherapists teach known as ‘Heaven and Hell’. When climbing up steps, always lead with the good leg as the good go to heaven which is up. When descending a step, always lead with the bad leg as the bad go to hell which is down. I have also been issued with a pair of surgical crutches which I will require for support for about the next six weeks while my leg muscles strengthen sufficiently enough to allow the crutches to be eventually dispensed with. Another aspect that has to learned after knee-replacement surgery is correction of ones walking stance. As knee joint deterioration tends to gradually occur over a period of years, ones walking stance gradually alters to compensate for the ever-increasing disability. The change is often so gradual that the individual is often unaware that a change to walking stance is occurring. Once a knee-replacement operation has taken place, an instant correction to body stance occurs and the mind has to learn to rapidly re-adjust to the change. The one thing I am truly thankful for is the UK has a National Health Service (NHS) that was introduced in 1948. It is paid for by wage earners paying a not expensive contribution from their earnings to a National Insurance fund, which in turn provides free medical care irrespective of cost to all UK nationals. Most UK nationals are horrified at the stories we hear about the prohibitive cost of medical care in other countries and cannot understand why other governments do not run similar schemes. Some countries do but the majority do not. l looked up the cost of the operation I have just had in the US and find the average cost is $49,500 upwards. That is more than the average UK annual wage. I know people in the US pay into various medical insurance schemes which is fine for those that can afford it. However those that are financially disadvantaged can find themselves without any medical cover at all. Although most UK residents including myself do not fully understand the intricacies of Obahmacare or the US medical insurance market, we are bemused about all the fuss we hear about effectively demolishing health care for the financially disadvantaged. The treatment I have just received at the Shepton Mallet Treatment Centre is NHS funded and is certainly not second rate . It would match tip-top health care anywhere else in the world. I personally find it reassuring to know if I have a medical problem, it will be effectively and efficiently dealt with for free regardless of cost. On my return home, I think it would only be right and proper for me to write to the managers of Shepton Mallet NHS Treatment Centre congratulating on both their efficiency and the well organised care they have provided. It is sometimes difficult for organisations to actually know they are doing exceptionally good and more than meeting their targets unless people tell them so. It is not necessary to do all the exercises at once as them are designed to be gradually introduced as knee flexibility and muscle strength improve. The one thing I have enjoyed is being able to walk again. Walking is also part off the exercise regime and the time one is allowed to walk progresses about every 4-5 days. I can now comfortably walk about one half a mile daily which may not seem much to a normal fit person but again is initially something of a challenge to someone with a newly replace knee. I will soon be able to increase the time I spend walking daily with the key advice of never over-doing things and always remaining within ones comfort zone. I do enjoy however the pleasure of once more walking without knee pain and meeting people in my village on my little sorties. 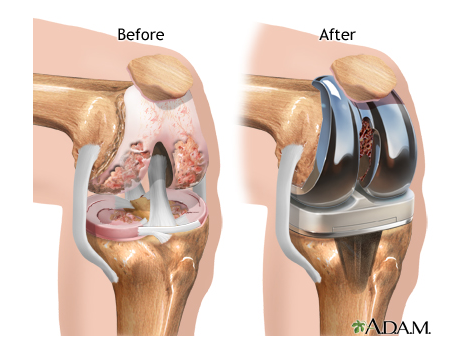 Although the walking exercises are not about speed, I have also found I am now naturally covering the same distance faster than before my knee operation which just shows how effective knee replacement surgery is. I also paid a return visit to the treatment centre a few days ago for them to access how my recovery is progressing. Everything seemed to be to text book standard. The amount one can bend ones knees was measured using a protractor with arms. After being introduced to various new exercise my knee was measured again and it and the protractor showed an increase in the amount my knee cold bend. It just goes to show the effectiveness of the exercises. I was also advised that my knee stability and muscle strength had improved to the point where I now only needed to use one crutch. I did try my first walk yesterday only using one crutch but I did carry my other one with me more as a safety blanket to reassure my mind that I could manage. What I did notice is that my leg muscles became tired more quickly than before as this showed just how much support the additional crutch had been providing. My next visit to the treatment centre will be i about two weeks time where the surgeon who carried out my operation will assess me. Hopefully he will also agree that I can drive again during that consultation. One thing I am already certain of is that when the time comes for my second knee replacement operation, I will definitely choose Shepton Mallet NHS Treatment Centre again. It is something I will be discussing with the surgeon on my forthcoming visit with him.